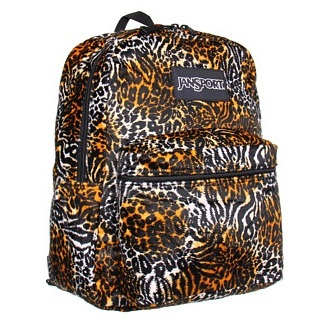 Now you can switch from mild to wild in a flash with the brown Tiger Inner Beast Collection by JanSport®. Straight-cut and padded shoulder pads. Adjustable shoulder pads provide a comfortable and snug fit. Detachable swivel hooks for reversing. Spacious main compartment for all your essentials. Front zip pocket with organizing panel helps keep your things tidy. Capacity: 1550 cu in / 25.4 L.
Material: Polyester pile and 300D polyester.